Three Ahmadi traders were shot dead in Faisalabad at about 10 p.m. on April 1, 2010. The attackers took away nothing else but their lives. They fled having committed these target killings. Mr. Ashraf Pervez, 60, Mr. Masood Javed, 57 and Mr. Asif Masood, 24 were returning home in their car after closing their business, when the assailants riddled them with bullets. All three received grievous injuries. They expired on their way to the hospital. Mr. Pervez and Mr. Javed were brothers while Mr. Masood was son of the latter. Mr. Pervez has left behind his widow, two sons and two daughters. Mr. Javed is survived by his widow, a son and two daughters; while the other son was murdered in this incident. Mr. Masood has left behind his widow and a one-year old daughter. The family is well-known as Ahmadis in Faisalabad and enjoys very good reputation. They had no personal vendetta against anybody; however the mulla had them in his crosshairs for their faith. In anti-Ahmadiyya riots of 1974, a mob indulged in arson and destroyed their business in Rail Bazar. According to the daily Dawn of April 3 the victims “were being threatened by unidentified people … . Sources said that victims Asif, Arshad and Masood (sic) contacted People’s Colony police in view of the threat a couple of weeks ago and the police advised them to limit their movements and hire guards for their security.” The inaction of the police against the plotters, and its mere advice to probable victims raises many questions. Ahmadis have been murdered in Faisalabad before, and suffered kidnappings for ransom recently. The kidnappers told their victims that their faith was the main cause of their ordeal. They had to pay heavy amounts to secure their release. It is reasonable to assume that the criminals or at least their links are known to the authorities, as anti-Ahmadi elements do not bother to keep their sectarian animosity secret. It is noteworthy that the slain Ahmadis had sought police help well before they were attacked. Faisalabad has been a center of anti Ahmadiyya agitation for long. Nine Ahmadis have been murdered here for their faith in the past few years. The administration and the police are well aware of the elements who, under the cover of Khatme Nabuwwat activism, indulge in criminal activities against Ahmadis, but the officials handle them with great leniency and consideration, following the policy of the provincial government on this issue. Anti-Ahmadiyya rhetoric in open-air conferences is permitted to clerics in the Punjab, where the mulla exhorts the audience to violence against Ahmadis by declaring them Wajib ul Qatl (must be put to death). Last year, on one such occasion that involved Christians, the Chief Minister stated: “We do not have the right to rule if we can not protect and provide justice to the minorities” (The Daily Times; August 8, 2009). However the police and the administration get a different message from Lahore than the one sent out to the press. Mian Shahbaz Sharif is the Chief Minister in Lahore; Faisalabad is well covered by a big team of high officials both in the administration and the police; but there was not a single public statement from the official quarters at the occasion of this triple murder of innocent Ahmadis. Since the promulgation of the Anti-Ahmadiyya Ordinance in 1984, 108 Ahmadis have been murdered for their faith. Hardly any of the assailants have been arrested. In a few cases when they were arrested and faced trials, the courts acquitted them, or if convicted, the higher judiciary took a lenient view of their crimes and reduced their imprisonment terms most benevolently. One such case happened in Faisalabad. Since the beginning of this year, five Ahmadis have been murdered to-date. Mirpur Khas, Sindh; March 30, 2010: The Civil Judge Mirpur sentenced three Ahmadis, Mr. Masood Ahmad Chandio, Mr. Abdul Razzaq and Mr. Abdul Ghani to three years imprisonment under Ahmadi-specific law. This case was registered almost four years ago. At the instigation of two mullas, one Muhammad Ali son of Sharo reported to the police and had a criminal case registered under PPC 298-C, 341 and 34 against five Ahmadis for preaching, in FIR 62/2006 at Police Station, Satellite Town, Mirpur. Two of the accused, namely Maula Bakhsh and Muhammad Akbar who were fresh converts were arrested by the police. The other three, Messrs. Masood Ahmad Chandio, Abdul Razzaq and Abdul Ghani went into hiding and applied for bail before arrest. Later, when the plea for bail of the five accused was presented in the court, the two detainees told the court that they had recanted. The magistrate, however, did not release them on bail and sent them to prison. Thereafter, the other three accused applied for bail in the Sessions Court, where the plea was granted. This case lingered on for four long years. The Civil Judge awarded maximum sentence under the law to the accused. The law is specific to Ahmadis, and has been condemned internationally as a bad law by the human rights concerns, because it severely restricts freedom of religion and belief. Sargodha is notorious for its mullas who thrive on anti-Ahmadi activism. It has a running history of Ahmadis’ persecution perpetrated by the clerics in league with the police and the administration. On October 5, 1974 rioters had a field day here while Mr Hanif Ramay, the Chief Minister (PPP) was present in the city. Recently an anti-Ahmadiyya conference was held here on 26 February 2010 at the occasion of the birthday of the Holy ProphetPBUH. As usual instead of speaking on the excellent example of the Holy ProphetPBUH the speakers railed at the Ahmadiyya community. They indulged in lies, slander and provocation. They took a pledge from the audience that they would not visit Dr. Sheikh Mahmood Ahmad (a famous Ahmadi doctor) for treatment and would not avail the services of Mr. Waqar (a reputed Ahmadi advocate in Sargodha). Another conference was held in a village Chak 35-North in district Sargodha. They led a procession on the occasion of 12 Rabi-ul-Awwal and did not fail to abuse the Ahmadiyya community. Some well-wishers of the community from the Tiwana family tried to stop the marchers. This resulted in a quarrel. Police cases were registered against both parties. The marchers also implicated an Ahmadi in the case registered against the Tiwana family, accusing him of aiding and abetting the incident. Rabwah: This month Press Section of the Sadr Anjuman Ahmadiyya issued its annual report on: Anti-Ahmadiyya news published by the Urdu newspapers – 2009. It makes interesting reading. The report was restricted to the major Urdu national dailies. During the year 2009, it was a matter of routine for the Urdu papers to print anti-Ahmadiyya statements and hate-promoting news in bold headlines. However, no paper had the courage to print the Ahmadiyya viewpoint. In 2008, one thousand and thirty-three such news items appeared in the press, but in 2009 these increased to one thousand, one hundred and sixteen items. Almost all of these were prejudiced, hate-promoting and false. The daily Nawa-i-Waqt (Editor: Majeed Nizami) printed the most news at 162 i.e. one almost every other day. The daily Express stood second, and the daily Jang (founded by Mir Khalil ur Rehman) and the Khabrain were in third position. Mullas are in the habit of making slanderous statements. These are published without any verification. As a result, common folk get agitated and inflict physical and costly harm upon Ahmadis. As a result of such provocation and hateful propaganda eleven Ahmadis were murdered last year for their faith. 600 Qadianis received training in Israel for anti-Pakistan activities. Mirza Qadiani does not deserve to be called ‘human’. Maulana Zafar, Maulana Khaliq, Qari Abdul Waheed, Maulana Aziz ur Rahman and others address the conference. Maulana Zahid ur Rashidi urged (the audience) not to lower their morale in the face of the White House and not to let their difficulties get the better of them. Pakistan’s security and sovereignty is threatened on account of government policies. Its frontiers have been defiled by a series of drone attacks on Pakistani territory. Frequent raids on madrassas have led to fear among students of Islam. Action is being taken to exclude Islamic teachings from the syllabus. Muhammad Aslam Alipuri of Denmark stated that Mirza Qadiani is not fit to be called a ‘human’ (sic). Muhammad-ul-Hasan Nomani disclosed in his address that a Khatme Nabuwwat Centre has been established at a cost of (Rs.) 20 million close to the Qadiani mission and center in Birmingham built with financial help from the European Union. This is a big blow to the followers of false prophethood. One who tells lies cannot be a prophet, the Promised Messiah or a Mujaddad; he is only a liar and a Deceiver. This is what was reported in the press; the unprintable rhetoric was more hateful, provoking and abusive. The World Tahaffuz-e-Khatme Nabuwwat Council published a calendar for 2010 which carries provocative writings against Ahmadis. It carries a slogan: The only cure for Qadianis: Al Jihad, Al Jihad. It motivates the public to undertake the murder of Ahmadis. It asserts: ‘… they (Qadianis) have no right to live in Pakistan; it urges: “Cleanse your streets of Qadianis.” etc. Several such hate-promoting pamphlets against Ahmadis are distributed throughout the country, regularly and systematically. Recent attacks and hostile activities against Ahmadis result from the efforts of sectarian agitators and social anarchists who promote murder and violence in the name of religion and play a pivotal role in provoking communal hatred in society. Last year when this calendar was published the Ahmadiyya central office wrote to the authorities to ban all publications that promote sectarian hatred, but they took no effective action. Consequently eleven Ahmadis were murdered for their faith in 2009. In the prevailing crisis, the negative role of the print and electronic media further encourages extremist elements. These elements undertake violence against harmless groups in the name of religion, thereby harming the country. Since 1984 when Ahmadi-specific laws were enforced, 108 Ahmadis have fallen victim to religious hatred and extremism. Edicts of murder against Ahmadis are routinely issued. Such murders and attempted murders continue in the new year too. Despite prohibition, the publication of this calendar that promotes and prompts violence calls for appropriate action by the authorities without any further delay. Pakistan claims to provide a universal right to vote to all its citizens, which proves to be contradictory to the facts. Indeed, the members of the Ahmadi community have been denied this fundamental right. The shameful regulations implemented against Ahmadis are in violation of the 1973 Pakistani Constitution and the process of democracy itself. Right before the elections, the Election Commission issued instructions based on the circular [No.F.1 (6)/2001-Cord] of 17th January, 2007 to maintain a separate electoral lists system, entitled “Preparation of Separate List of Draft Electoral Rolls for Ahmadis/Quadianis”. The eighth amendment to the 1973 Constitution, enacted in 1985, imposed this separated system. Since then, elections have been held in the country with separate electoral lists for different religious groups. This system is primarily aimed at Ahmadis, the most vulnerable and discriminated minority in Pakistan. In 2008, for being registered as voters, those who claimed to be Muslims had to sign a certificate of faith and deny the veracity of the holy founder of Ahmadiyya Muslim Community. Of course no Ahmadi would agree to do so; they were thus de facto denied their right to vote. The marginalization of Ahmadis, leading to a discriminatory electoral system based on religious beliefs is in violation of national and international legislations, as well as the spirit of democracy itself. Under the Pakistani Constitution, every Pakistani citizen has the right to vote irrespective of their race, religion, creed or belief. Article 25 of the International Covenant on Civil and Political Rights also states that “every citizen shall have the right and opportunity to vote and to be elected.” Articles 19 and 21 of the Universal Declaration of Human Rights also guarantee the right to vote to every citizen. The right to vote is one of the most basic and fundamental rights that must be guaranteed to every citizen and without which a state cannot call itself a democracy. It must be reminded that Article 20 of Pakistan’s Constitution guarantees each citizen’s freedom “to profess religion and to manage religious institutions”. Article 33 gives the state the responsibility to “discourage parochial, racial, tribal, sectarian and provincial prejudices among the citizens”. Moreover, Article 36 ensures that the state “shall safeguard the legitimate rights and interests of minorities, including their due representation in the Federal and Provincial services”. The Asian Human Rights Commission therefore strongly calls for significant governmental measures in order to tackle this issue and restore the democratic norms in their true spirit. The Pakistani government must repeal all discriminatory laws against religious minorities, for all Pakistani citizens must be equal before the law. The 1973 Constitution before the shameful anti-Ahmadi amendments must be restored. Moreover, all national and international texts that guarantee fundamental rights, such as the right to vote, must be literally implemented. The electoral system based on separated lists must be outlawed and all Pakistani citizens must be treated equally, irrespective of race, religion, creed or belief. It is only through these essential steps that justice and the rule of law can be restored and that Pakistan could finally call itself a democracy. Burewala (correspondent):Abdul Latif Cheema, the General Secretary of Majlis Ahrar Islam Pakistan stated that Tehrik Khatme Nabuwwat will begin countrywide celebrations of Yom Shuhada-e-Khatme Nabuwwat on Friday, March 5, in memory of 10,000 martyrs. Addressing the local pressmen in Burewala, the Central General Secretary said, “It was during the Muslim League’s administration (in the 1953 anti-Ahmadiyya agitation) that maximum shooting took place on March 5 and 6; and in Lahore alone, thousands of Islam’s sons had their breasts riddled with bullets.” He appealed to the Ulama Karam of all schools of thought to pay tribute to the martyrs of Khatme Nabuwwat in their Friday sermons, and also lay bare the intentions of the Qadiani-Jewish lobby. Lahore – 23; Sialkot – 5; Rawalpindi – 1; Faisalabad (Lyallpur) – 7; Sahiwal (Mintgomary) – 1. These add up to a total of 37. The mullas have quoted in the past different figures on different occasions, the highest being 30,000 dead, but they seem to have generally settled on the figure of 10,000 – i.e. 26,900% increase over the actual total. Half a centenary later, the Ahrar have not bothered to change their colours. A few weeks ago, according to a press report, the DCO Sahiwal had ordered Abdul Latif Khalid Cheema to stop speeches in public (Zuban bandi) (The daily Din; December 22, 2009). This was a very appropriate order meant to promote peace in society. The orders perhaps have been withdrawn. Officials in Pakistan are made to wilt before the extremists by politicians. Mr. Shahbaz Sharif knows it; he complained to the Taliban for not sparing his province despite … . The Muslim Ummah will have to unite by setting aside secondary differences. Infidels have declared a state of war against Islam. It was a great achievement of Bhutto to declare Ahmadis non-Muslim. The government should not waste the achievement of its Leader. “Religious hatred is on the rise in Pakistan. Accountability is a must,” stated Dr Ahmad Ali Siraj of the International Khatme Nabuwwat Movement, in Express Forum. The views and self-contradiction of these mullas is monstrous. Their public statements and TV appearances promote nothing but hatred and animosity. It is about time someone took notice and inquired into their mission and financial sources – and whether they really represent Saudi and Kuwait interests. Conventional wisdom would suggest that a state which permits internal aggression against a small community, is bound to experience further aggression against other communities regardless of their size, resulting in some sort of implosion. 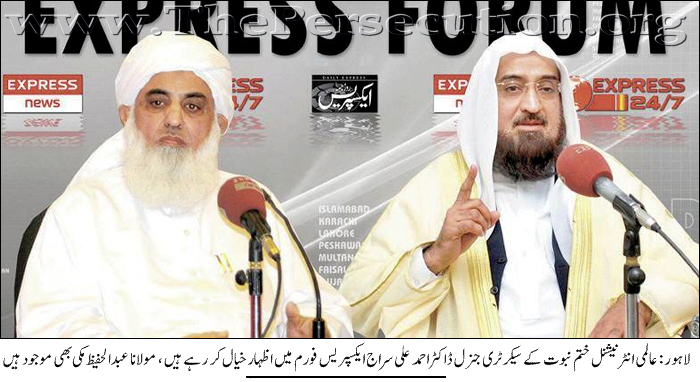 Lahore: Dr Ahmad Ali Siraj speaking in the Express Forum; Maulana Abdul Hafeez Makki is also present. Lahore, Faisalabad, DI Khan, Karachi; March 2010: We mention below some news from the print media, and also highlight stories published earlier that have a direct link with these deplorable events, in the hope that those who control the destiny of the state of Pakistan will learn their lesson. 7 Killed, 44 injured in DI Khan, Faisalabad sectarian violence. Barelvi Eid Miladun Nabi rally comes under fire, mob attacks Deobandi seminary in DI Khan. Six injured in Faisalabad violence, scores of vehicles torched. More than 80 injured – attack carried out using 600 Kgs of explosives. Investigators find bomber’s head. Lahore: city of life threatened once again. Belief in Prophet Muhammad (saw) Khatman Nabiyeen, his Prophethood, love and obedience to him is a basic identity of our religious oneness and national unity. Belief in his End of Prophethood is part of our faith. To protect the Namoos Risalat (honour of prophethood) is our religious duty. Anyone who is guilty of disrespect to him, directly or indirectly, openly or by implication, is an infidel, apostate and must be killed (Wajab-ul-qatl). Mr Sharif should not expect such Ulama to deliver on peace and harmony in society. There is no other way to restore stability and peace in the province than an immediate, open and abiding break between the state and the mulla. * Sipah-e-Sahaba leader in critical condition. Four others wounded. Saeed Ahmad Jalalpuri, The leader of the Aalmi Majlis Tahaffuz Khatme-e-Nabuwwat, his son and two were gunned down in Sachal police precinct (in Karachi). One wishes that the present day Ulama renounce violence and promote peace and harmony in society which will benefit all, including themselves. Illegal blasting in Karana Hills endangers human lives. Several wayfarers have been killed. Citizens and factory workers have been seriously injured. Stones fly faraway to the residential area on both sides of the hill due to heavy explosions that hit rice mills, houses and traffic. Citizens and factory workers have been seriously injured, several wayfarers have been killed. DCO ordered registration of a case against the contractor, but no action has been taken yet. Chenab Nagar (Staff Reporter): Influential contractor of minerals carries out stone blasting in Karana Hills from Choongi No. 3 to the bridge of Chenab Nagar Unit 10 at night despite the imposition of PPC 144. Many stones have hit residential area on both sides, houses in Darul Fazal, Shahab Rice Mills, other houses and traffic on the Sargodha Road due to heavy detonations which has resulted in the death of several wayfarers and serious injuries to local citizens living in houses and the factory. It is worth noting that many delegations of local social groups and elders have failed to persuade the stubborn contractor to stop such illegal blasting in view of such casualties and dangers. A delegation comprising elders and victims of such casualties visited the DCO Chiniot and presented him with a written application. DCO told SHO Chenab Nagar to register a case against the contractor but no action has yet been taken in this regard. The lives of people living on both sides of the hills are at constant risk. They demanded that the higher authorities of the mineral department cancel the lease (of stone-blasting). Quaidabad, district Khushab; 26, 27 March 2010: Mullas tried their best to disrupt marriage ceremonies of Ahmadis here. They put pressure on the invitees to refuse to attend the functions. They threatened a cook hired for the occasion, who then refused to report for duty. The transporters who were engaged for the occasion failed to turn up. However, alternate arrangements were made and the ceremonies were a success. A mulla named Athar Hussain played a key role in all this. He is always active against Ahmadis. He contacts influential people in the area and urges them to fire Ahmadi employees and implement social boycotts of other Ahmadis. He promotes sectarian hatred and religious extremism in the area. Islamabad: Mr. Waleed Ahmad, an Ahmadi student of engineering at COMSATS Islamabad escaped an attempt on his life in the university premises. He was a target of sectarian hatred for some time. Recently the Jamiat (the student wing of Jamaat Islami) obtained an edict from a mulla, announced that Waleed is Wajib-ul-qatl (must be killed), and attempted an assault on him. He escaped from this with help from some other students. It is note-worthy that such extremism is flourishing right under the nose of the government, in the capital, in a well-known university. And here we notice, with a deep sense of irony, that the Parliamentary Committee on Constitutional Reforms has so continuously shied away from touching any of the provisions rammed into the Constitution by Zia in the name of Islam in order to serve his own twisted notion of religion and satisfy his hunger for power. How does avoiding concrete steps to undo the damage that was done, and still is being done, by what that dictator did help his ‘eradication’? Mr. Muhammad Iqbal was imprisoned for life in a fabricated case of blasphemy. He was arrested in March 2004, and is currently incarcerated in the Central Jail, Faisalabad. An appeal has been filed with the Lahore High Court against the decision of the Sessions Court. It is registered as Criminal Appeal No. 89/2005. He is now in the seventh year of his imprisonment. The Civil Judge Mirpur, Sindh sentenced three Ahmadis, Mr. Masood Ahmad Chandio, Mr. Abdul Razzaq and Mr. Abdul Ghani to three years imprisonment under Ahmadi-specific law on March 30, 2010. They are now in prison. Students protest upon closing an historic educational institution, Ahmadiyya Girls School. Chenab Nagar: Influential contractor continues illegal blasting of hills. High officials urged to take action. Chenab Nagar: Load-shedding (electricity non-availability) exceeds 20 hours (per day). Chenab Nagar: Influentials occupy hundred of land plots belonging to the Minerals Department: The land mafia indulges in land grab on account of officials’ negligence. Zardari hoped that after the package is finalized the 1973 constitution would be restored to its original form. Blackwater is involved in the number of Ulama Karam and explosions at Karachi. * Eight soldiers among 50 killed. Taliban claim responsibility for attacks. Shahbaz Sharif congratulates Maulana Ilyas Chinioti upon the success of Muslim League in by-elections. Maulana Chinioti met Shahbaz Sharif CM Punjab. According to the Maulana the CM thanked him for great support in the by-elections by securing votes of members of the banned organizations in favour of Muslim League’s candidates. Maulana Chinioti conveyed the greetings of Maulana Abdul Hafeez Makki, Maulana Alam Tariq and Maulana Muhammad Ahmad Ludhinwi to the CM. Note: This Saleemulla is the same mulla at whose suggestion on May 25, 2002 in a conference in Islamabad General Musharraf retracted from Joint Electorate to deny the right of vote to Ahmadis. Politicians concerned over ‘N’ affiliation with Sipah-e-Sahaba. ANP information secretary says PML-N’s tacit support of extremists in Jhang by-polls detrimental to national stability. Ziaul Haq to be deleted as president from history. Jamaat Islami deputy secretary for information hurls threats on publication of facts. He behaved badly with the staff reporter of the daily Jinnah, used bad words and threatened dire consequences. NATO forces’ agents are involved in explosions (here). Events are leading to Third World War. This situation is being created to impose the Third World War which will not be fought between capitalism and communism but between Christians and Muslims. Even by the wretched standards of the cesspit of lies and cravenness that can be the Pakistani political establishment; the comments made on Sunday by Punjab Chief Minister Shahbaz Sharif are extraordinary and demand the most vigorous condemnation possible. Some channels give an open floor to what are quite clearly and men who unabashedly spout hatred and violence in the name of religion and nationalism. The administration knows that the state has gone weak; so whenever non-state Jihadi actors enter the towns to shed human blood, it joins hands with them. Historically, it can be argued that the rot started with the decision to ostracize the Ahmadi Community by Zulfiqar Ali Bhutto’s government in the 1970s. This and similar action were used as stepping stones by dictator Ziaul Haq, to raise an entire edifice of controversial, so-called Islamic, laws. The damage done to the nation, especially to women and minorities by Zia’s wholesale amendments to the constitution has been his lasting legacy. A fit of medievalism erupts every time a crime against a woman or a minority citizen surfaces. Such laws are controversial and bad because under them victims of violence are suddenly assumed to be guilty, as is the case with Hudood Ordinance or indeed the infamous blasphemy laws. …One way of getting rid of all such discriminatory laws is to restore the 1973 constitution in its entirety – in fact, as it stood at the time of its promulgation.